Stuck In The Buckosphere: Less Snow Sunday-Monday? The two most consistent models have continued to push the heaviest snow further to the south. 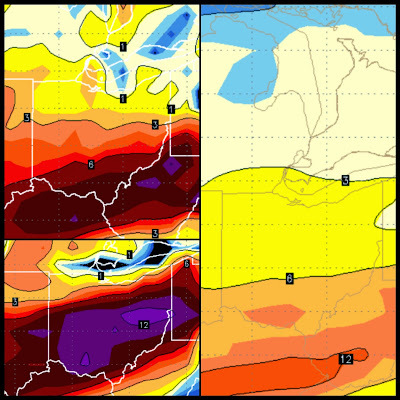 The image below has the Euro on the right, the GFS on the top, then the NAM in the lower left. The NAM still has us getting hammered, but I am starting to steer my mindset away from that. Luckily I will have a fresh round of models before the newscast, but if you go with consistency with the models then 3-6" is more likely (maybe some pockets of slightly more). So my blog yesterday showing the southern shift is becoming more than just a fluke. I guess the big change has been the Sunday night and Monday snow. It has weekend significantly. Keep in mind... I have not mentioned the ice for Southern Ohio. Areas South of I-70 will see up to 0.25" of ice. That is just as dangerous from a power outage stand point. I will have more later today with another post, but wanted to keep ya posted this morning. Have a good one!